So looking back on the blog so far, I realized just about every post is pasta, pizza, or (randomly) crab. This one is a little different from the Italian/crustacean pattern I've been following. We decided to branch out and go with sushi. 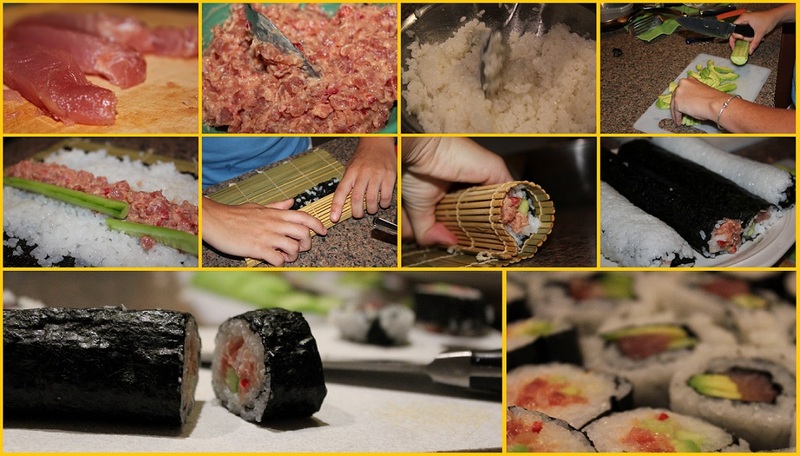 You need some special equipment for sushi, namely, a sushi mat to roll on. We decided on tuna, cucumber and avocado for fillings. Tuna seemed kind of tame by itself so we decided to attempt spicy tuna. For that we needed to make an aioli but replace the garlic with some spices. I chopped half a pound of the tuna as small as possible, minced a cherry pepper, and combined it all with three tablespoons of mayo, a tablespoon of olive oil and a pinch each of paprika and cayenne. For the sushi rice, we cooked it according to the instructions on the package then dissolved some sugar and salt in rice vinegar and vegetable oil. Once both the rice and the vinegar mixture cool we combined them. To assemble, we laid out the mat, then a piece of sushi nori (seaweed), covered 3/4 of the nori with an even layer of rice, filled with the desired fillings, rolled and cut. It takes some time but isn't that difficult. It's a lot cheaper than getting it out and tastes a hell of a lot better when it's fresh. Enjoy your change up, I'm sure I'll be back to pizza and pasta soon. HOW COME YOU NEVER MADE US SUSHI?!?! ?